You throw a dice until you get 6. What is the expected number of throws (including the throw giving 6) conditioned on the event that all throws gave even numbers. This entry was posted in Combinatorics, Probability, Test your intuition and tagged Test your intuition. Bookmark the permalink. I would have thought bigger than two. I calculate three. This seems so obvious — completely different from the usual “test your intuition” questions (like the previous one). What am I missing? I had the same thing. I read the question, answered the poll with the first obvious answer (thinking first is cheating), thought for a few more seconds, and I am now sure that the second obvious answer is true. Then I tried to make bad student’s mistakes and they were also options in the poll (one of them has place third in the current poll), so I think that there are at least three obvious answers. As long as at each given moment there are no two contradictory obvious answers there is no global threat for mathematics as a whole. Lior, I realize that it is important to have obvious questions from time to time so that readers’ intuition will not be tilted to the non-obvious. Dear James, please comment on the new post coming soon. Dear Lior and James, It is certainly easier than TYI 29. I shall reveal what people’s intuition was, and propose to wait for a detailed solution to the solution post. Lovely results! I would love to know what kind of intuition leads someone to guess 1 here. At least the truth comes in second. By the way, the question was invented by Elchanan Mossel during a undergrad class. Students asked Elchanan to give more examples and he invented it on the spot (it was at Penn in 2014-15). Speaker: Aldous answered a conjecture of Mezard and Parisi and showed that in the limit the expectation for the assignment problem is . Question from the audience: Did it confirmed or refuted the conjecture? Another voice from the audience: Mezard and Parisi conjectured that the answer is not and Aldous refuted this conjecture! A quibble. When I first read the question I was unsure if you meant a single FAIR die or a pair of FAIR dice were thrown. On rereading I decided you meant a single fair die. Dear Joe, should I correct the English? From the discussion I think everyone understood. Yes, it is a single die rather than dice. Since I told Gil the story today, I will share the nicest explanation, that I heard from Paul Cuff. 2 and 4. What is the mean of T? Finally, observe that T is independent of the value among 1,3,5,6 obtained in the T’th toss, so conditioning that value to be 6 does not affect the mean of T.
I can’t wait to unleash this on my students. That is a very elegant solution indeed. Here is a very different one – less compact, but with an ingredient that may be of general interest. Consider a bet B on the number of throws: you get T dollars when the T-th throw is 6 after only 2s and 4s; as soon as a throw gives an odd number, the bet stops. Upfront you pay the mean payoff, call it x, but you get it back in the latter case. Then x is the answer to the puzzle. Here B’ is the induced bet as of the second throw, “2 if 6, x if 1,3,or 5, B’’ if 2 or 4”, with B’’ the bet as of the third throw, etc. Note: to replace B’ by x+1/4 is specific to the puzzle, but the idea behind using x in the payoff (*) relies on a very general idea: fixed point updating. It covers Bayesian updating as a special case, without reference to probabilities. The interested reader is referred to a post (August 18) on this topic at the Decision Theory forum at groups.google.com. This is a funny question. You have to define ‘expected’ and for a single die. Then the number N for the number of throws will be in the range 1 < N < infinity (with very bad luck) and the probability curve peaking at pi! 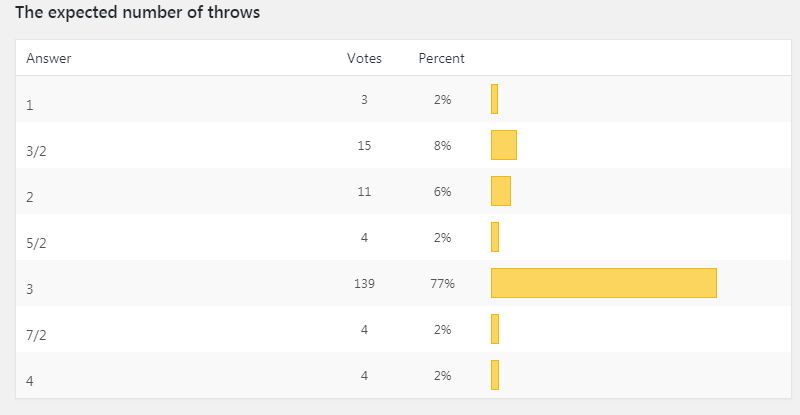 Previous 2 and 4 throws don't count. I got it wrong. Looking at the solution (where you ask about the first time you don’t get a 2 or a 4) I had a very nice ah ha/oohhhh experience. When I tried to go through it by figuring out the probability of getting an all even sequence I noticed something interesting. It’s 1/4, which means conditioned on getting only even numbers until a 6 the probability of getting a 6 on the first role is (1/6)/(1/4)=2/3. After the fact I can see why, if you get a 6 on the first roll then the game ends and you’re in the “all even” subworld, if you get a 2 or 4 you might (3/4 of the time) not be in the “all even” sequence world. It’s interesting that the answer doesn’t change, if you change the rule to stop on the first 5 or 6.
six-sided fair die until the first six comes up. throwing six given all evens has probability 1 – 1/6 – 1/6 = 2/3. 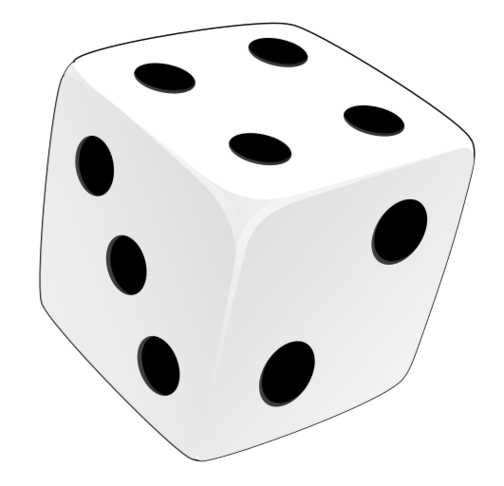 to roll a six is 1/(2/3) = 3/2.